Residue is…strange. It’s strange in a good way…but it’s definitely strange. It’s like if Nightbreed and John Dies at the End had a baby. Luke Harding is a for-hire private detective struggling to make ends meet. He lives in a crappy apartment, he’s late on his rent, and he hasn’t seen his daughter in two years. When he receives a call from one of his employers, Mr. Fairweather, to deliver a mysterious package for ten grand, he jumps at the chance — no matter how strange the circumstances. When he attempts to deliver the package, he’s stopped in his tracks and is forced to take the package home and open it. Inside is a mysterious journal that, once you start reading, causes you to lose track of time. With his daughter arriving at his apartment, and everything starting to fall apart, Luke finds himself fighting for his life. Residue is an original, crazy ride. It feels like an old pulp fiction crime thriller, complete with seedy alleyways and voiceover narration. The coloring is beautiful, and it somehow seems completely futuristic and vintage at the same time. There’s a strong 80’s vibe in the film’s opening, and it really sets the stage for the rest of the film. Written and directed by Rusty Nixon, this story is completely independent from anything I’ve seen before — yet it pays homage to so many things we love in this genre. It’s a careful tightrope that’s walked, and it’s done quite well. One stand out thing about his film is the practical effects. There are quite a few different monsters in Residue, and they all look wonderfully old school yet very realistic. The makeup is incredible, and the monster casts are astounding. I wanted to pause the movie and just spend ages looking at all the different creations. Acting wise, there are a few stand out performances, with my favorite being Matt Frewer as Mr. Fairweather. This character is so insane yet controlled, and I loved every moment he was on screen. James Clayton who pulls off the noir, broody vibe incredibly well, plays our lead. And Taylor Hickson, who handled a very emotional role with respect and care, plays the daughter, Angelina. There’s some strong character dynamics at play in this story. The father/daughter relationship is handled really well, and I got quite emotional in the final scenes. Luke and his possible love interest, Monica, have a few funny and sweet moments that I enjoyed as well. Now, the journal itself, which is basically the main character, is slightly confusing. There was an interesting backstory at play for this journal to explain why it has the power it does, but I feel as though they didn’t spend enough time on it — I got a little lost a few times. It does have a strong creep factor to it though, and I think it could happily sit alongside iconic horror movie items like Hellraiser’s Lemarchand’s box. 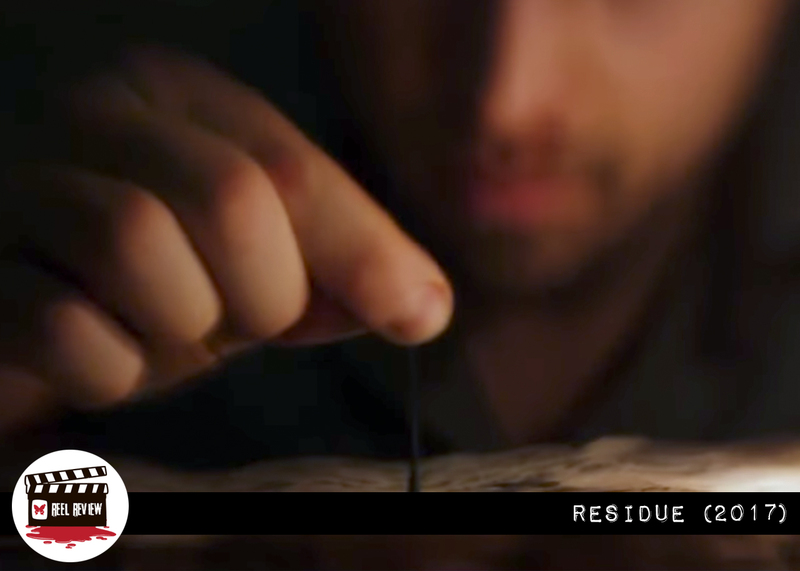 Although this is a modern film released in 2017, Residue feels like it’s already a cult classic. It spins you around in circles and then laughs as you try and walk in a straight line. Time can’t be trusted, characters can’t be trusted, and the journal certainly can’t be trusted. But ultimately you’re going to have a great time watching it. While the scares are not strong, that’s not what this film is about. Give this one a chance, enjoy the ride, and I think you’ll be very pleasantly surprised. Watch it now on Amazon Video or other VOD outlets.